Shopping online is fun. It fetches lot of savings to the shopper. Plenty of designs, collections and patters are available which provides a complete flexible shopping to the shopper. The payment options are also quite flexible which allows the shopper to shop easily at any point of time. They can shop and opt for COD options, where they would have to pay while receiving the item. The credit card options are another versatile option, where the person can use their credit card to make the payments and later on pay the credit card company. These are some of the factors which make shopping easier for an online shopper. An online shopper can also find many other benefits on using their credit cards or debit cards. Plenty of banks have tied ups with some of the shopping sites and provide an additional discount of 5% to 25% percent to shoppers when they use the credit card of that particular bank. This extra discount makes the shopper happier. The shoppers can also find some discount codes provided by the banks. If the shopper has the discount code then they can provide the discount code at the time of payment and avail some additional discount on their shopping. Definitely, these benefits are one of the greatest attractions which drive the attention of shoppers worldwide. Some of the banks such as Axis bank, HDFC Bank, ICICI bank and SBI bank provide customers coupon codes and additional discount offers on using their credit cards in some specific online shopping stores. You can check out the options that they provide before you make an online purchase. In stores like Jabong, Amazon and Myntra you get additional discounts on using specific bank cards. Even in makemytrip you have special discounts on specific credit cards. These options may vary from time to time. Therefore before you shop check for the offers! 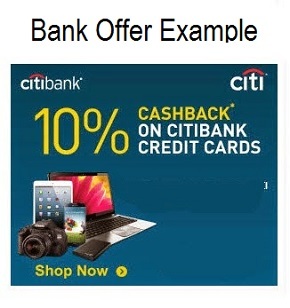 I feel ICICI bank comes up with most numbers of offers for online shopping & offers rewards too. I recently opened up an account with ICICI bank for the same reason. Those 2% cashback’s & 10% extra discount actually add up to a lot more if we account all the expenses we did for a year. Though its a marketing gimmick for the banking companies but its beneficial for us too. Amazing article to read after such a long time. HDFC has a special section when I logon to their net banking account. Their offers are coool & exciting along with cash back offers & instant loans too. Hdfc has special coupons for sites snapdeal, abhibus, etc. which I usually keep using. And Thanks Nitesh for ICICI about their offers too.